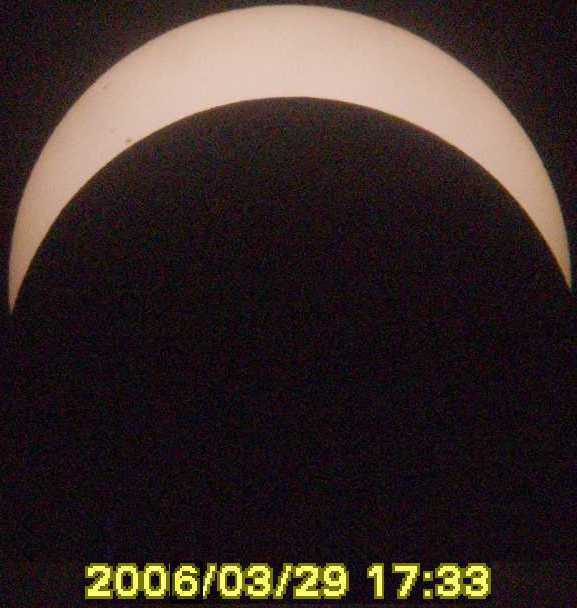 29 March 2006. Partial solar eclipse. Main events (Sun altitude, degrees), l.t. (UT+7h). 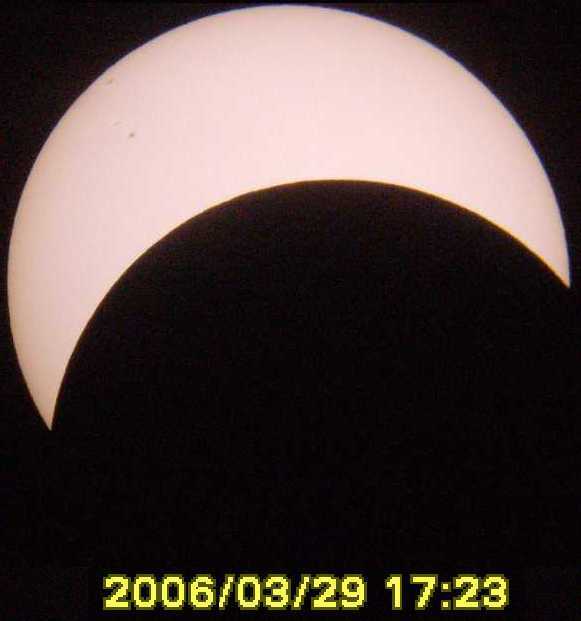 For Novosibirsk this solar eclipse was the next after the eclipse on 31 May 2003, which happened almost three years ago. On the eve in was overcast all the day. Satellite maps were showing that till 29 March a cold front was to pass over Novosibirsk and the growth of air pressure after cold mass invasion left hope for clearing. From the morning 29 March the temperature began dropping, but the same time the clouds moved in again with strong charges of snow and wind. 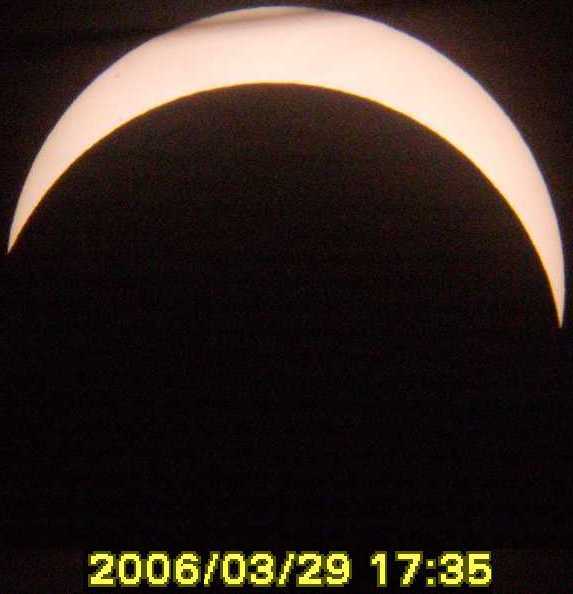 The eclipse was to begin in the evening and just an hour before its start the sky began clearing. A half an hour before the eclipse I set up telescope and prepared my camera. I made several trial shots and marked out some small sumspots on the Sun, which moved recently from its backside. By eclipse beginning the sky was already mostly clear, only some small ragged clouds were rushing, brought by wind. Looking in the telescope, I noticed the moment of the I contact. The Moon began rapid ingress on the solat disk. After 2-3 minutes a small loss on the lower limb of the Sun became visible with unaided eye. 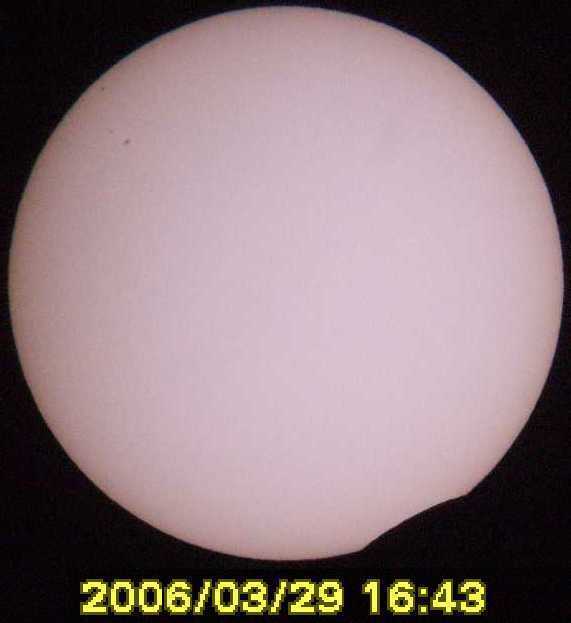 After getting phase ~45% the first signs of solar light declining could be seen (by the way, on 31 May 2003, when maximum phase was 43%, a similar light darkening was felt around the max.) The phase continued to grow and the darkening was more and more distinct. After phase ~80% the sky began loosing its blue color, becoming grey. Clouds were also not brightly yellow, but had pale-white color, not differing grealy from the sky. The level of light aroud maximum phase was nearly correspondent to the moment recenlty after sunset. Dogs in the neighbourhood began barking. 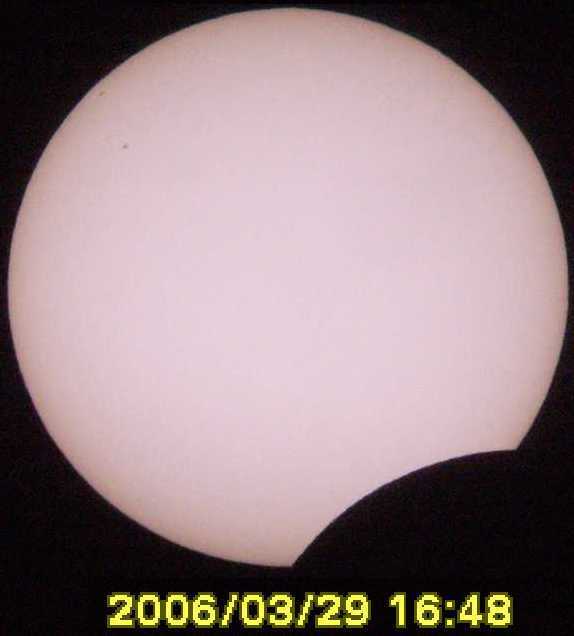 Unfortunately, just before the maxumum the Sun for the telescope left behind the house standing westwards, so the rest part of the eclipse I watched only visually. Around the max. narrow solar cresent during just several minutes turned from the position "horns downwards" on its back. The picture began to develop in the reverse direction. The wind suddenly subsided, barkening stopped. The temperature, which stayed near 0C, began rapid dropping. The Sun was closing to the horizon, hanging only several degrees above it, but the sky was getting blue again, the darkening was diminishing. I watched the eclipse until it was hidden behind the clouds near horizon. Though, it happened only 4 minutes before the last contact. When the night dark came, the clouds moved in again with snow. The sky cleared again only in the evening 1 April. Before it was total overcast mostly with snow. The weather on the eclipse was very lucky.